Book Condition: Item is intact, but may show shelf wear. Pages may include notes and highlighting. May or may not include supplemental or companion material. Access codes may or may not work. Connecting readers since 1972. Customer service is our top priority. Comment: Item is intact, but may show shelf wear. Pages may include notes and highlighting. May or may not include supplemental or companion material. Access codes may or may not work. Connecting readers since 1972. Customer service is our top priority. 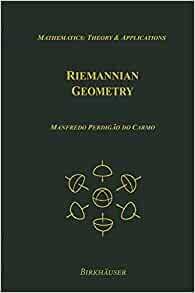 Riemannian Geometry is an expanded edition of a highly acclaimed and successful textbook (originally published in Portuguese) for first-year graduate students in mathematics and physics. The author's treatment goes very directly to the basic language of Riemannian geometry and immediately presents some of its most fundamental theorems. It is elementary, assuming only a modest background from readers, making it suitable for a wide variety of students and course structures. Its selection of topics has been deemed "superb" by teachers who have used the text. A significant feature of the book is its powerful and revealing structure, beginning simply with the definition of a differentiable manifold and ending with one of the most important results in Riemannian geometry, a proof of the Sphere Theorem. The text abounds with basic definitions and theorems, examples, applications, and numerous exercises to test the student's understanding and extend knowledge and insight into the subject. Instructors and students alike will find the work to be a significant contribution to this highly applicable and stimulating subject. "This is one of the best (if even not just the best) book for those who want to get a good, smooth and quick, but yet thorough introduction to modern Riemannian geometry." "This is a very nice introduction to global Riemannian geometry, which leads the reader quickly to the heart of the topic. Nevertheless, classical results are also discussed on many occasions, and almost 60 pages are devoted to exercises." "In the reviewer's opinion, this is a superb book which makes learning a real pleasure." "This mainstream presentation of differential geometry serves well for a course on Riemannian geometry, and it is complemented by many annotated exercises." Though this text lacks a categorical flavor with commutative diagrams, pull-backs, etc. it is still at an intermediate to advanced level. Nevertheless, constructs are developed which are assumed in a categorical treatment. It does do Hopf-Rinow, Rauch Comparison, and the Morse Index Theorems which you would find in a text like Bishop-Crittendon. However, it does the Sphere Theorem, an advanced theorem dependent on the Morse Theory/calculus of variations methods in differential geometry. Even "energy" is treated which is the kinetic energy functional integral used to determine minimal geodesics, reminiscent of the Maupertuis Principle in mechanics. The reader is assumed to be familiar with differentiable manifolds but a somewhat scant Chapter 0 is given which mostly collects results which will be needed later. The treatment is dominated by the "coordinate-free" approach so emphasis is on the tangent plane or space and properties intrinsic to the surface with only a brief section on tensor methods given. Realize the tangent space has the same dimension as the surface to which it is tangent and this can be greater than 2. If you remember from advanced calculus, you took the gradient of a function of n variables (the function maps to a constant as a sphere say does). The gradient defined the normal to the(n-1) dimensional tangent hyperplane to the surface. The surface is also (n-1) dimensional since given (n-1) values to the variables the nth value is determined by the function equation implicitly. Note in this construction we used the embedding in our interpretation, nevertheless this gradient/tangent hyperplane notion can be given an intrinsically defined method of getting the tangent space through the related notion of the directional derivative. Forging this to a linear tangent space is a key construct which the reader should grasp, one not available in Gauss's lifetime. The text by Boothby is more user-friendly here and is also available online as a free PDF. Boothby essentially covers the first five chapters of do Carmo (including Chapter 0) filling in many of the gaps. Both in Boothby and do Carmo the affine connection makes appearance axiomatically and the covariant derivative results from imposed conditions in a theorem construct. If this is a bit hard to chew (it was for me) there are exercises 1 and 2 on pp. 56-57 of do Carmo in which you are to show how the affine connection and covariant derivative arise from parallel transport. Theorem 3.12 of Chapter VII in Boothby does this a bit too formally but you can find it in various forms on the web. In particular there is a nice one where the tangent planes are related along the curve over which the parallel transport or propagation occurs resulting in a differential equation which gives both the affine connection and the covariant derivative. Just Google "parallel transport and covariant derivative." I have certain quibbles like in defining the Riemannian metric as a bilinear symmetric form,i.e., his notation is a bit dated here and there but the text shines from chapter 5 on. So 5 stars. P.S. There's a PDF entitled "An Introduction to Riemannian Geometry" by Sigmundur Gudmundsson which is free and short and is tailor made for do Carmo assuming only advanced calculus as in say rigorous proof of inverse function theorem or the first nine (or ten) chapters of Rudin's Principles 3rd. It does assume some familiarity with differential geometry in R^3 as in do Carmo's earlier text but you can probably fill this in from the web if you're not familiar from past coursework as in vector analysis. Differential manifold and tangent space are clearly developed without the topological detours-pretty much if you're familiar with the derivative as a linear map (as in Rudin), you're at the right level. Also Lang's "Introduction to Differentiable Manifolds" is available as a free PDF if you want to see the categorical treatment after you get through do Carmo-can also be used for reference concurrently, example-isomorphic linear spaces? This is the book isn't for someone who has never been exposed to differential geometry. If you know the basics of manifolds and are determined to learn some fairly difficult mathematics this is the book to learn Riemannian Geometry from. There are quite a few pages where the font changes abruptly from Bookman Old Style to Arial font, very bizarre. Otherwise, pretty good the binding seems solid. 5.0 out of 5 starsgood, instructive book, but not for the "beginners"
This is a concise, and instructive book that can be read easily. However, this is not for the absolute beginner. Let me explain what kinds of knowledge you should have before digging into this book. You should already be familiar with basic smooth manifold theory found in first few chapters of books such as "Introduction to Smooth Manifolds" by John Lee. For example, the author assumes that you already know how to define tangent space using "derivation." He also assumes that you know the precisely how to show maps between two manifolds are smooth using the coordinate presentation of the map. He also assumes you know tensors. He won't really distinguish coordinate presentation vs the actual map because these are all assumed to be already mastered by the reader. Also, you have to be able to understand his notation from the proof. He has his own set of notations without explanation. Once you read the proof, its meaning becomes clear but this won't happen unless you have some knowledge in smooth manifold theory. With all these prerequisite, reading should be smooth and fun. I sometimes wished he had more pictures but it's not to the level that bothers me. Overall, great book to read on your own! 2.0 out of 5 starsJust OKAY. I gave this book two stars to offset some of the higher ratings, otherwise I might have given it three stars. I think this book is OKAY. This book seems highly regarded from the other reviews of this book, but as a student learning Riemannian Geometry for the first time, I would have to say that the proofs are often quite terse and difficult to read. The book is also lacking in pictorial illustrations, and I am a believer that geometry books should have many pictures as they make visualizing certain things much easier and maybe as a first time student the picture we draw ourselves won't be the "best" thing to visualize the concept. Finally, the books presentation is rather boing. The author tries to motivate the concepts in the introduction to each section, sometimes successfully and sometimes not. These introductions are often long winded and difficult to follow because he seems to assume you understand the terms he is using before they are even covered. It is, in my opinion, more helpful to read some of the mathematics first and then look back at the introduction later, or look at it before and after. There major redeeming point for this book is that it gets into Riemannian Geometry rather quickly after a short Chapter 0 on Differential Geometry. The Chapter 0 is not sufficient to learn Differential Geometry for the first time, but does a fairly decent job of establishing notation. Overall I would not recommend this book for self study, but if you have the guidance of a professor to help fill in the details it should be OKAY for learning Riemannian Geometry. Classics but not for beginner. This is another well-written text by Do Carmo. I browsed through it and found I could not understand several passages because I did not know what the special symbols meant and there was no table of symbols. I plead with the publisher to add such a table to the next edition or printing.